A turtle is crossing the road! 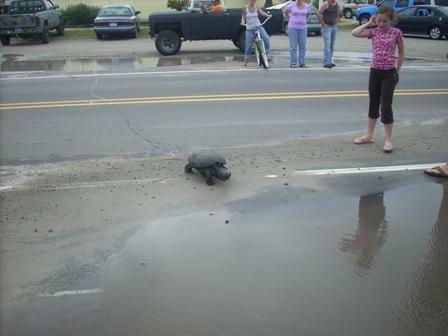 A common snapping turtle (C. serpentina) crossing a road. Turtles are frequently hit by cars while crossing roads. If you see a turtle crossing the road please help it across in the direction it is heading. First, make sure that it's safe to help (do not endanger yourself or others by walking into heavy traffic). Move the turtle in the direction that it is traveling (this is not necessarily toward water). Turtles know where they are going and will turn around and march right back into traffic if you return them to the side of the road they came from. Small turtles can be easily carried across the road. Large snapping turtles do pose a challenge. We suggest the "keep pushing with foot" method. Don’t lift them by the tail. It is no different to lifting a large dog by the tail, with injury to the animal almost certain. Why do turtles go onto roads? 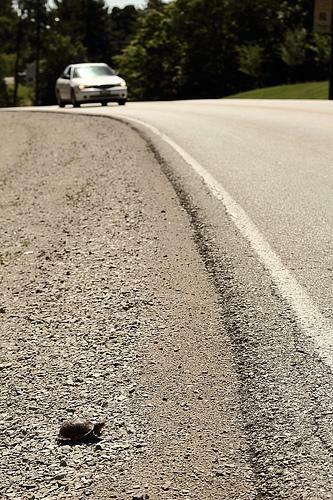 Turtles will move from one body of water to another throughout the year but most turtles encountered on roadways are females during the nesting season in May and June. Turtles often have to cross roads during these movements. I found a turtle in my neighborhood/backyard! We recommend placing signs around your neighborhood along with your phone number to assist the owner in finding their pet. If an owner doesn't come forward, the animal shelter can then put the turtle up for adoption into a secure (usually outdoor) habitat. Do not relocate and release turtles to another area even if it looks suitable for turtles. Studies show that relocated turtles may not survive. Therefore, we do not promote releasing turtles that must be relocated. People inexperienced in turtle care may provide inappropriate care or assume euthanasia is the only solution. 2. Put the turtle into a container he/she cannot crawl out of. Do not put the injured turtle with any other animals including other turtles. 3. Place a damp towel or damp paper towels on the bottom of the container. 4. Put the turtle in a quiet place. 5. When transporting to a veterinarian or wildlife rehabilitator, cover the turtle container - human contact can be stressful to wild animals. 6. Note exactly where the turtle was found so it can be returned after recovery if appropriate. 1. Do NOT remove healthy turtles from the wild. Turtles can sometimes heal from injuries and scars may be present in recovered individuals. 2. Do NOT put the turtle in water. 3. Do NOT attempt to repair or clean the fracture site. 4. Do NOT put ointment on the fracture site. 5. Do NOT put the turtle outside of your house. Any injured tissue is subject to maggot infestation. 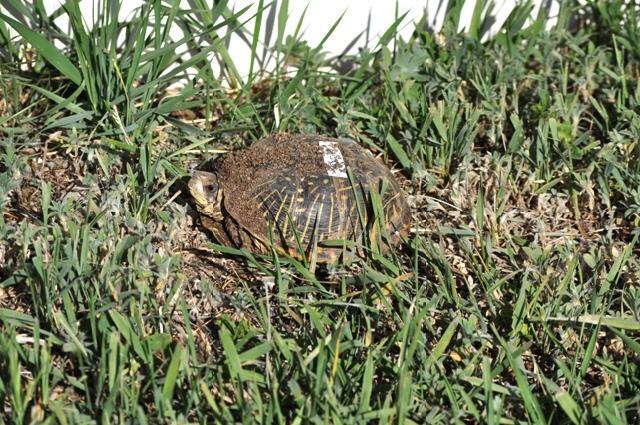 If the turtle cannot be brought inside, put them in the shade and cover the container they are in. If you need to hold the turtle overnight before transporting them, the turtle must be kept in a safe place where nocturnal predators (raccoons) can't get them. A Western Painted Turtle (C. p. bellii) - Colorado's State Reptile! Can I release a box turtle, red-eared slider, or other turtle that I bought at a pet shop? 1) Disease transfer to wild populations is a real risk. You say your turtle is healthy? So were the Europeans that infected Native Americans with deadly small pox. 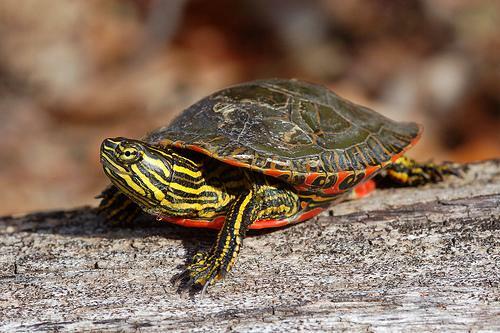 2) Red-eared Sliders (that start out as those little green turtles) have become such an invasive species that they are stressing native turtle populations. 3) Even if your pet turtle is a native species, you still have the risk of disease introduction plus the introduction of an animal not sharing the "local" genetics of a local population. In summary, once a captive, always a captive. You took the animal into your care (or let your child get it.). It is your responsibility to continue that care or find someone willing to take over that responsibility.